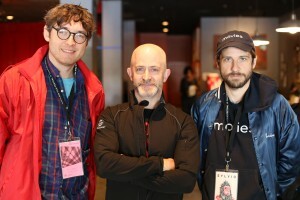 I met with directors Albert Birney and Kentucker Audley on Sunday, May 7, 2017, at the Maryland Film Festival, where we discussed their collaboration on Sylvio, which premiered at SXSW (where it was reviewed by our very own Don Simpson). They both act in it, as well, though you’d never recognize Birney, since he spends the entire movie in a gorilla suit. 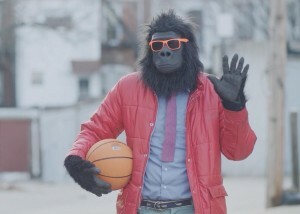 Sylvio, you see, is a feature-length adaptation of the one-time viral Vine sensation (Vine, now defunct, was an online app that allowed users to post six-second videos). A gleefully anarchic romp through the twisted minds of its creators, the film is a boon to those in the mood for something completely out of the ordinary, following Birney – aka Sylvio – as he tries to make it as a cable-access superstar on a show hosted by Audley. Here is a condensed digest of our conversation. Hammer to Nail: So, I never watched the original Vine videos. I was not a Vine guy. What is connection of the plot of the feature film to those short skits, which were just 6 seconds long, each? Albert Birney: That’s a good question. In the beginning we thought that maybe we would try to turn some of the six-second Vines into longer pieces in the film, but I think we realized, very early, that it was going to be more like the energy and the feeling of all the Vines, instead of directly adapting certain ones. And over the course of 800 Vines, we got to understand who Sylvio is: he sometimes likes to dance; he likes the quiet moments, he likes to go for walks in nature; and he also loves to express himself with his puppet. I guess one thing that we took from the Vines was where Sylvio would get aggressive, or act like a gorilla, and break things. Those ones were kind of popular, so that made its way into the film, with the “What’s the Ape Gonna Break?” motif. HtN: Well, yeah, I can definitely see the connection with that! Kentucker Audley: We wanted to draw from the spirit of the Vines, but also inject an overarching story, so that it didn’t feel like an extended sketch, but felt like there was a central pursuit, a central character’s struggle, with one thing that you were following, rather than these disparate bits and pieces. HtN: So you layered a three-act narrative on top of these anarchic short skits. KA: Yeah. I was very interested in trying to work within a very traditional structure for the first time. We were raised on movies of the 1980s, with some of these ludicrous concepts that go by a formulaic structure, and we wanted to do that, but adding a lot of anarchy and entertaining weirdness. AB: Pee-Wee’s Big Adventure is such a huge film, for us, with this weird man-child. You know, if you break it down, it’s such a strange film, but it’s also got so much heart, and it’s just a guy trying to get his bike back, and it just becomes this amazing adventure, with all of these interesting characters coming in. To get back to the Vines real quick, I always loved the ones that were really still, and it would just be Sylvio doing something quiet. You know, that’s how the Vine account started, with these little quiet moments. And then, as it grew, and expanded, I had some more fun doing the more outlandish set pieces and props and things, which are great, too, but for me, it started with those quiet moments. So I think that worked its way in with the struggle over Sylvio wanting to do [the puppet] Herbert and document these quiet times of his life vs. breaking things and being this huge beast, which he does, and we’ve done, and we would make those Vines, but I think that the heart of what I love is just documenting reality in this special way, where people would leave comments on the Vines, like, “Wow! I wish I could live in Sylvio’s world. It’s so magical!” And you know, it is your world, we’re all living in that world, it’s just how you look at it. HtN: And you’ve kind of given us that world, the behind-the-scenes of Sylvio’s world, in this movie. You have responded to those comments. We are now living in Sylvio’s world. HtN: So, Sylvio, himself. A gorilla. How did that start? AB: Well, it’s kind of a weird, long, convoluted story. HtN: I’ll take the short version. AB: The short version, yeah. 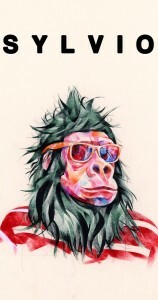 So, basically, I had the gorilla suit, and I was going on tour with this band, and one of the guys in the band said, “Bring any costumes you have and we’ll integrate them into the show.” So I packed Sylvio in the car. And then it also coincided with Vine coming out, and I was like “Wow! I’m going to be driving across the country for six weeks. It’d be great to document it on Vine, but I don’t necessarily want to record myself in these different places. If I dress as a gorilla then…” And that’s how it happened. Timing. It all came together, and then I saw people were responding to it. HtN: So it’s not a long-standing alter ego of yours, from childhood. HTN: It was coincidental that you became Sylvio in that way. AB: Totally! It just happened by accident. But then, looking back on my youth, growing up, I loved the original King Kong – I watched that as a kid – and Donkey Kong was always my favorite Nintendo character in video games. There was a collection of children’s books by Anthony Browne, and they’re all gorilla- and monkey-based, which I loved. So there were all these little things that made their way into Sylvio. KA: These things seem sort of accidental, but the older I get, the more I see the connections between early, developmental influences and…I have the same thing with the Follow That Bird movie out of Sesame Street, where I didn’t realize how much of an impact that had had on me, as a kid, until we made this movie. I see the connections now. I just made that Follow That Bird! Instead of a big bird, it’s a gorilla. HtN: So, how did you two decided to work together on this? KA: It was a movie called Funny Bunny that we were working on, and Albert was the boom operator. His Vine account was very popular, at that point, and I classified him as the most famous person on set. And we got along, really well and had a good rapport, and wanted to work together. The idea of working on a project with an already established character and something that’s a little more surreal than my usual foundation, gave me the opportunity to work on more story elements. I wanted to understand more of how movie structure works. I felt like it was hard to get in there unless we had this great leap-off point where we say, “Of course, this isn’t reality.” I was kind of too fixated on reality at that point and was trying to tap into some larger, universal storytelling elements, and I think that just starting with an unreal concept helped me understand a very simple structure and tell a different kind of story. HtN: Albert, once it was determined that you were the most famous person on set, did you then boom in full Sylvio regalia? HtN: And the director was Alison Bagnall. HtN: So you’ve somewhat addressed this already, but…I really liked the narrative anarchy of much of the film, which I assume comes from the Vine videos. At the end, however, you wrap up the story with a more traditional third-act ending. Did you ever consider allowing the anarchy to overflow, or were you always committed to the more conventional conclusion? KA: That’s a good question. We’ve been thinking a lot about that this weekend. To me, it was important to appeal to a different audience than we’ve been appealing to for the last 10 years. We didn’t want it to be overly cool or trendy and wanted to tap more into this satisfaction of a traditional narrative, tried and true. We were trying to tap into these tropes that have been tested for many years, which people love, and can very easily go over into cliché, but the devices that we use and the tropes that we use, with this ending being triumphant, rather than this open-ended ending, seemed pretty logical for the story that we were trying to make. HtN: I love that moment, because you incorporate Sylvio’s puppet, Herbert Herpels, into that, as well. KA: Yeah. He’s now in the puppet world, and it kind of changes styles. AB: And he gets that trophy and he gets that validation from this character he’s created that is also part of him. At that moment, it’s what he wants, and everyone wants, which is to feel loved. KA: I will see one more thing about the happy ending. HtN: It’s not happy. It just concludes the story. That’s what I mean. It’s a very conclusive ending, whereas a lot of the rest of the film is very anarchic. KA: Yeah. I guess I have this sense that…I’m different and always trying to be subversive, in new ways, and I think that we’ve all seen the inconclusive ending so many times. It’s like hip to end your movie in a way where it doesn’t complete the story in an obvious way. Now, I think it’s subversive to actually complete the story in the obvious way. So there was a lot of tapping into these tropes, to do the things that other movies do, because that’s what this is. This is a movie. So to me, that’s subversive in its own way. We didn’t want to kill the joy of it, by doing that. It’s that line, “Are we making fun of this? Is this satire?” We both really enjoy these things, and we’re also commenting on the fact that this is what a movie is. KA: (laughs) It’s like it’s new, because it’s in a gorilla suit. HtN: (laughs) So you can get away with that! HtN: Speaking of making Sylvio’s world come alive, I think you should next make a film about his puppet, Herbert Herpels. I watched the film and thought, “I love this little puppet show that Sylvio puts on. I want to see that!” And then Herbert came alive in the cloud scene. So you know that at least one person wants to see the feature-length story of Herbert Herpels. AB: Two people, because I want to see it, too! (laughs) You know, to get into character for Sylvio…some actors do research, they’ll study someone they’re basing their character on. For Sylvio, in the months leading up to the filming, I wondered how I could get into his head. And I thought, “I’ll just make Herbert Herpels’ puppet show!” And I made, like, 50 of them. Most of them aren’t even in the film. But for me, I love to play in that little world. I just think it’s so funny to have this little puppet doing nothing, with this little gorilla fur sticking out of the bottom. I could literally watch a feature film of that. AB: When Vine first came out, I think in early 2013, for the first six months I was seeing such amazing things on it that I hadn’t ever seen before. For me, it felt like I had found my community. I thought, “I know what social media is now.” I was meeting all these amazing artists and comedians, and every day we were making these six-second videos and commenting on them. It was a great community, and I miss that. But that also kind of shifted, as Vine came into the mainstream, and there were comedians who were just doing racist humor, or these other lowest-common-denominator things. But I miss that original community, but it got us to this point, so it’s bittersweet, I guess. HtN: So, I’ve been asking this question of all the filmmakers I’ve interviewed whom I know have been here more than once. Everyone seems to really like the Maryland Film Festival. What makes it so special? KA: I guess, in its simplest form, it’s a congregation of like-minded filmmakers. and a lot of them. Everyone who is here likes each other’s works and is supportive. I feel like its a sort of sustained community. Having consistency of attendees over the years gives us a feeling of continuation of friendship and networking and collaboration. And that has a lot to do with the consistency of programming and consistency of staff. You know, it’s the same people running the festival every year, which is rarer, by the day. So a lot of it is just about bringing the right people together. KA: They treat the filmmakers really well. AB: …and parties. It’s just this little community that pops up around the films, and you see each other’s films and talk about them, and you get to see the shorts. And it’s all centrally located. At other festivals, there are sometimes 3 or 4 screens that are all across town, so you just go to one screening. But here, you see the same people crossing the street, walking around. It’s beautiful. HtN: Well, gentlemen, congrats on the film!